As a homeowner, you need to protect your property from pests. Termites are a common threat to buildings and can destroy the structural integrity of your home over time. In order to protect your property and prevent wood-destroying insects, it’s important to know the top signs of a termite infestation. Due to their similar appearance, people often mistake ants for termites. There are a few differences to know about between ants and termites so you can better recognize whether or not you have a termite problem. Termites have antennae that are straight instead of bent and have thicker waists. Termites are often lighter in color and can be found in shades ranging from creamy white to beige to darker shades of red or brown. There are no white or beige ants, so if you see an insect this color, it’s likely a termite. Mud tunnels on the exterior of your home are telltale signs of a termite infestation. These are thin, brown paths on your siding or foundation that serve as the insect’s route to the interior of your home. One way to tell if the tunnel is being actively used by termites is to break it open and see if it is repaired in a day. Whether or not the tunnel is active, you should still have a WDI inspector perform an inspection. Termites produce quiet clicking sounds to communicate and they can be heard within the walls of the house. 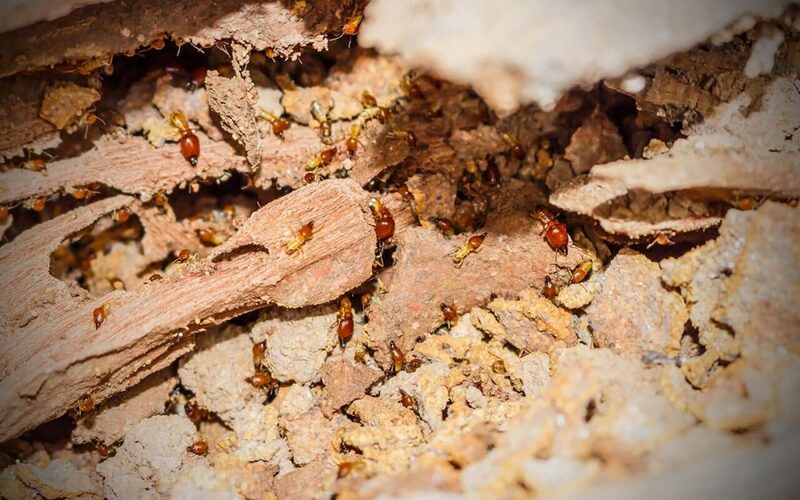 The worker termites can also be heard because they make a lot of noise as they eat, but you have to listen closely for these signs of a termite infestation. During the spring season, you may notice swarmers or discarded wings as they emerge from their nest to mate and look for a new place to start a colony. You may begin to spot discarded wings near the doors, windowsills, and other areas of the home, which is one of the commons sign that a termite infestation has already started. Termites eat wood from the inside out, so one way to determine if your home has a termite infestation is to knock on solid wood and listen for any areas that sound hollow. If the infestation has gone this far, the wood often needs to be replaced. It’s important to be aware of these signs of termites so you can keep your home safe and avoid having to pay thousands of dollars in repairs. Knowing what to look for will help protect your property and reduce the risk of damage caused by wood-destroying insects. AA Home Inspection provides wood-destroying insect inspections and other inspection services to Northern Kentucky and Greater Cincinnati. Contact us to book an appointment.